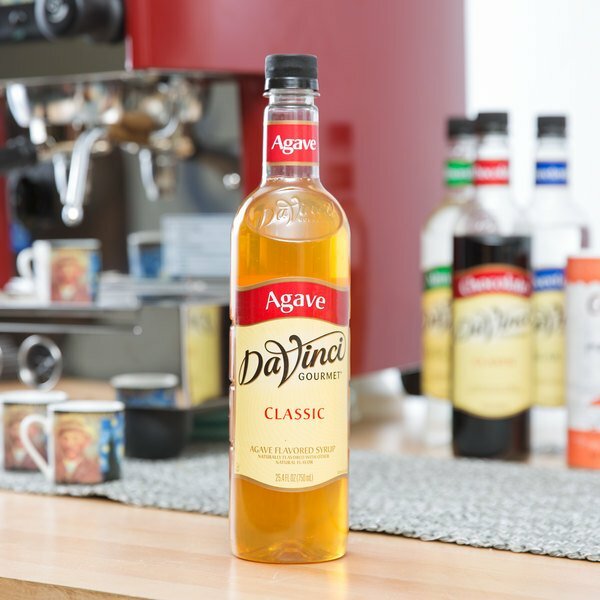 Choose from over 60 classic flavors, and discover the rich taste and quality consistency in each and every DaVinci Gourmet product, including this classic agave flavoring syrup! DaVinci Gourmet flavoring syrups are made from pure cane sugar and agave nectar to complement your beverages without overpowering them or being too sweet. They are specially formulated to hold up well under heat, making them the perfect choice for espresso-based drinks, brewed coffee or tea, and more. From the tropical blue agave plant native to Southern Mexico, agave nectar is slightly sweeter than honey and cane sugar, but it has a mild, clean taste and quick-dissolving properties that mix well with a variety of beverages, including iced coffees, teas, lattes, lemonades, steamers, and even smoothies. Try using it to add sweetness to ingredients during cooking or baking. Agave nectar is sometimes called honey water and is often used as a honey or sugar substitute in many recipes. One splash of flavoring syrup goes a long way, and flavored beverages enhance your menu with new, appealing items. This user-friendly plastic bottle is easy for your baristas and restaurant staff to handle. Sold in gourmet coffee shops, specialty food stores, food service outlets, and grocery stores, DaVinci Gourmet products, like this agave syrup, have a long history of commitment to quality and superior taste. This syrup is absolutely delicious. It gives a very sweet, natural taste once it’s added. It’s presented very beautifully. Our costumers are loving it, it taste absolutely amazing. The classic agave syrup is great and perfect for sweetening tea and coffee. A nice quality product that is awesome for any occasion or establishment. Very good alternative sweetener that is great for adding to bulk gallons of iced tea for a quick and easy sweetener. No more granulated sugar. We love this DaVinci agave syrup. 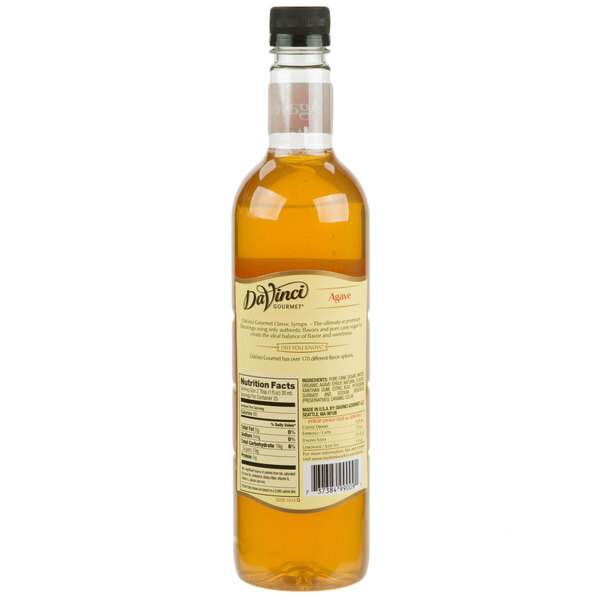 This is a great syrup to have at your bar to help you sweeten cocktail like margaritas and vodka sours. The syrup is sweet and taste great. We love this product for making fresh margaritas! Tequila plus fresh lime and da Vinci agave = perfection! Webstaurant has the best price around and we buy this often! It is important to always provide people alternate sweetening options for their beverages. 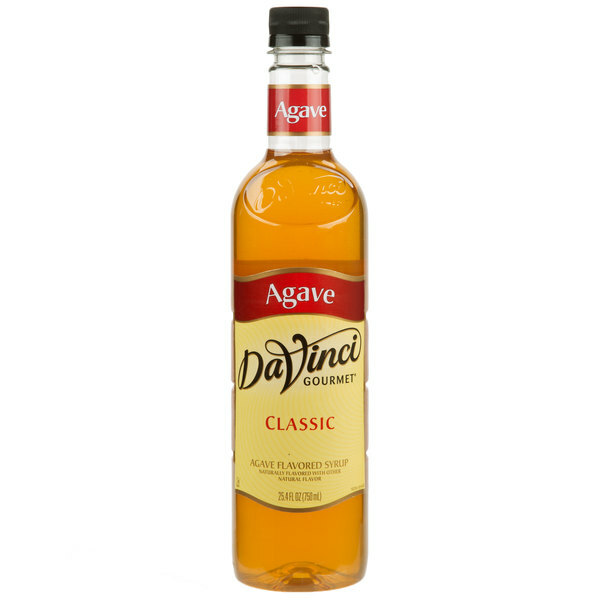 I find the Davinci Agave flavored sweetener as a nice alternate to a simple syrup. This is decent. I do like agave as a sweetener. There is no reason to add cane sugar to this but they did it anyway. We keep this product on our counter for regular use as a sweetener. The customers seem to love it. I am glad that we can offer so many options. Thanks! I wanted to offer several different sweetener options for my store and this one did the job well. Tasted great and customers seem to really like it.